When it comes to summer vegetables, May is prime planting time. Nighttime temperatures are in the 50s, daytime temperatures in the 70s and 80s, and there is little chance of a late frost. By May the soil has warmed up, too, giving bean, squash and cucumber seeds the conditions they want for sprouting and growing. So why am I writing about summer gardens in March? Because now is the time to get your beds ready for the summer season. First job: remove weeds. Cut them down, pull them, chop them up, but get them out of your garden beds before they go to seed. Now, while the soil is damp from spring rain, is the ideal time to do this. Weeds are relatively small now so you can pull them easily. If you wait until the ground is dry, you will not be able to remove roots so readily. While you're at it, if you have unplanted areas around your garden beds, keep them mowed before the weeds set seeds. 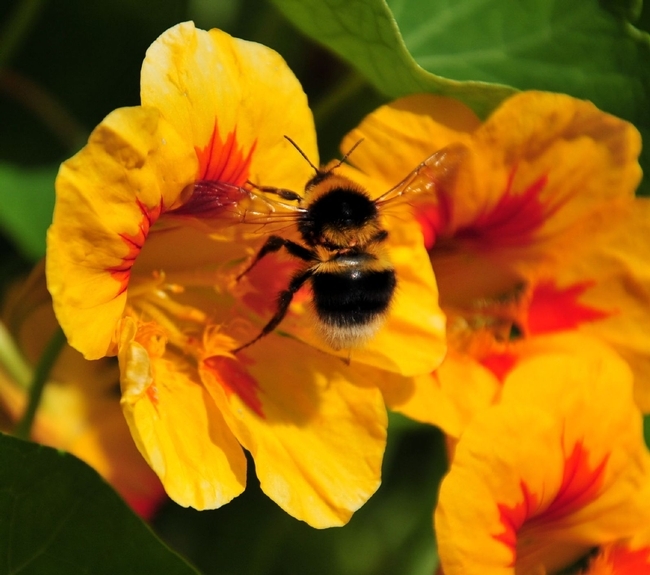 If you don't, the wind, birds and insects may spread weed seeds to your vegetable beds. Second job: add amendments. Many Napa County soils are largely clay. Clay soil absorbs and retains water well, but it lacks good aeration. Adding organic matter, such as compost, will help lighten the soil. Organic material allows the soil to form aggregates, or clumps, that enable root growth. Compost, homemade or purchased, is an inexpensive source of organic matter. Spread a two- to four-inch layer over your garden beds. You can allow the compost to sit on top for a week or two—a good idea if the compost is still warm to the touch—or dig it in right away. If you are gardening in raised beds or containers that you filled with purchased topsoil or potting mix, you may notice that the soil level has subsided several inches. Commercial formulations for garden beds are usually a 50/50 mix of clean, screened dirt and organic material such as compost. In contrast, ordinary garden soil is only 5 to 10 percent organic matter. Over time, soil organisms like earthworms and fungi digest the organic matter. You will need to re-fill these beds with additional material. Third, you probably need fertilizer. Newly dug ground often lacks nitrogen, as Napa County soils are typically low in this primary plant nutrient. 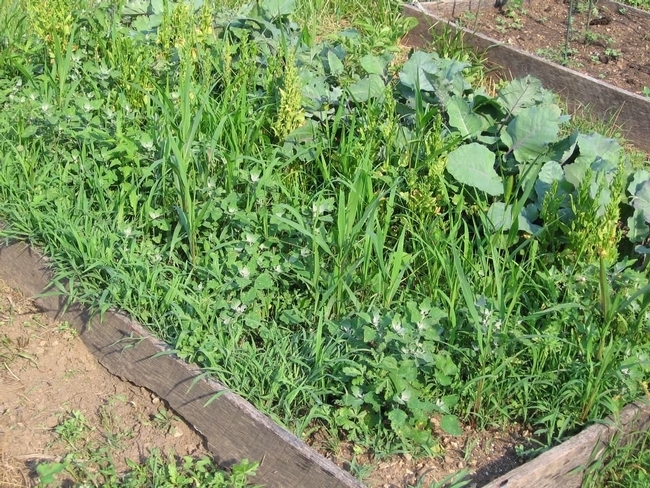 And if you are using beds that have been planted before, the previous crops used up some of the nutrients. Garden centers carry a variety of fertilizers, some formulated for a specific use, such as vegetables or citrus. Packaged fertilizers always give directions for application. Don't be tempted to use more than the recommended amount; too much fertilizer can “burn” plant roots and pollute water run-off. You may have access to manure from backyard chickens or rabbits, or bedding from stabled horses. Generally, such organic matter should be aged for several weeks or composted before using, as fresh manures can also burn plant roots. Do not use manure from carnivorous animals such as dogs and cats. Diseases that affect these animals can also affect humans. Before you plant, set up your irrigation system and get support structures ready. In our climate, drip irrigation is the most efficient way to deliver water to plants without wasting it. Trust me, it is much easier to install a drip system before the plants go in the ground rather than after.Put up tomato cages and bean poles before the vegetables are planted. Preparing the vegetable garden for summer can take some time, especially if you need to let compost or other organic matter age. But if your garden is ready for planting now, consider growing some quick, cool-season vegetables. 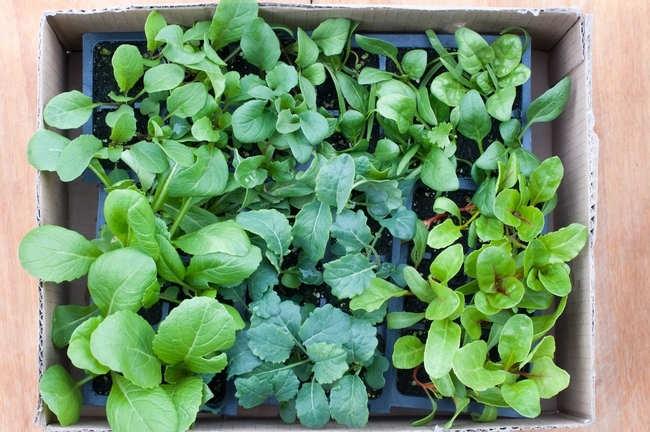 After all, May is two months away, plenty of time to grow lettuce, radishes, beets, Asian greens, arugula or carrots. Why shouldn't your garden beds work just as hard as you do? 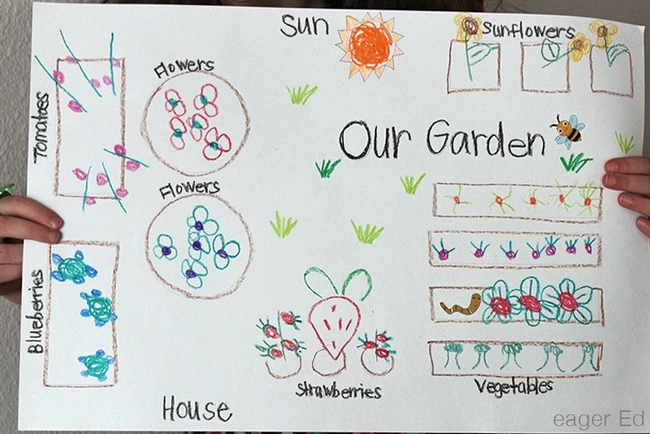 With the rain and spring-like weather we have had, you may be starting to think about planting summer vegetables. 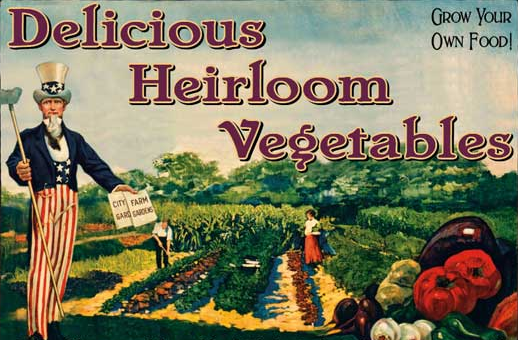 Perhaps you grew veggies last summer and met with mixed success. If so, a few changes may be necessary to produce the type, quality and quantity of harvest you want. The planting clock is ticking, so it's time to formulate a summer garden plan. The first decision is what to plant, a choice that should be based on what you and your family like to eat. If only one person in your family of five likes okra, you may be better off buying it occasionally at the farmers' market. 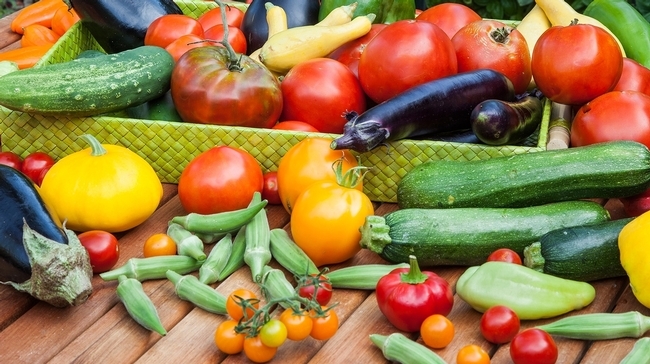 If everyone enjoys tomatoes, chiles, bell peppers, zucchini, eggplant, snap beans, cucumbers, sweet corn and cantaloupes, then these are the fruits and vegetables to focus on. 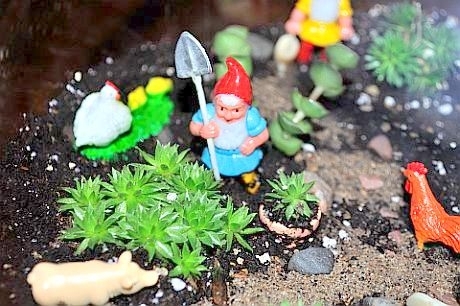 Next you must decide where to plant. Maybe in years past, your vegetable garden started out in full sun, but by Labor Day, the sun's path had moved behind the trees. If so, your tomatoes were probably still green at Halloween. Did gophers and voles enjoy too much of last year's crop? 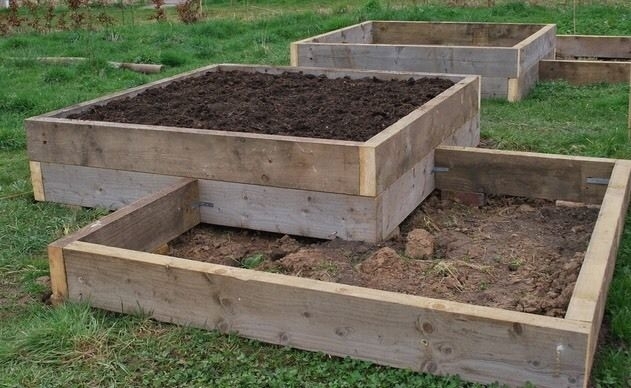 Consider building a few raised beds with hardware cloth on the bottom. You will need a sunny spot away from trees, preferably with a hose bib nearby. Let's imagine that you have three new 4- by 8-foot raised beds to work with. Now you need to decide how much to plant. A raised bed of that size can accommodate four to six tomato plants, so there goes one bed. In a second bed, you can fit 10 to 12 plants of chiles, bell peppers, eggplants, or snap beans. Now you have one bed left. If you planted two zucchini plants last year, you probably discovered that the yield was more than your family could eat. Maybe you took the excess to the Napa Crop Swap but found that everyone else also had zucchini to swap. So one zucchini plant should suffice this year. If you want snap beans throughout the summer, leave space for succession planting. You'll want to set out two or three plants every three weeks. One or two cucumber plants satisfy most households, so you've now used up half to two-thirds of your last raised bed. Still left to plant are cantaloupe and corn, and you don't have enough room for both. Corn grows more thaneight feet tall andmay cast shadeon yourother sun-loving crops. Better to plant cantaloupe in the remaining space and buy your sweet corn at the farmers' market. If you want to start plants from seed, you need to get started right away. It takes six to eight weeks for the seeds to germinate and the seedlingsto grow large enough to transplant. If you prefer to plant nursery seedlings, you can relax as you don't need to purchase those until you are ready to plant. Wait to plant summer vegetables until the danger of frost has passed, which is usually around mid-April. To be safe, plant no earlier than the last week of April. Although we have had rain recently, we are still in a drought. Consider this when you make your vegetable selections. It may be wiser to plant a ‘Stupice' tomato that matures in 62 days rather than a ‘Cherokee Purple' that needs 85 days to reach maturity. (Seed packets indicate days to maturity.) Faster maturation means fewer days of irrigation. To help your soil retain moisture, work in several inches of compost. Don't feed plants too much nitrogen as this will encourage leafy growth that requires water to sustain. 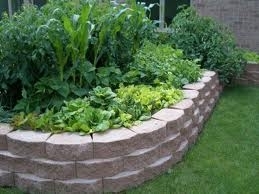 Once your garden is planted, add a layer of mulch several inches thick. Mulch will keep the soil cool, conserve water and inhibit weeds. Tomato Plant Sale: Napa County Master Gardeners will hold their second annual “Tomato Plant Sale and Education Day” on Saturday, April 19, in the South Oxbow parking lot on First Street in Napa. The sale will be held from 9:00 a.m. until sold out. All the seedlings have been started from seed and grown by Napa County Master Gardeners. More than 50 varieties of heirloom and hybrid tomato plants will be available. Master Gardeners will staff information tables on tomato support structures, common tomato pests and diseases, composting, good bug/bad bug displays and a mobile help desk. For a list of available tomato varieties, visit http://ucanr.org/ucmgnapa or call the Help Desk (hours below). Workshop: Napa County Master Gardeners will conduct a workshop on “The Small Home Vineyard” on Saturday, March 29, from 9:30 am to 11:30 am, and from 12:30 pm to 2:30 pm. at the Yountville Community Center, 6516 Washington Street, Yountville. The morning session will focus on bud break to harvest. Learn the basics of managing a small vineyard including grape physiology, canopy management, vine nutrition, fertilization, irrigation and cover crop. The afternoon session will focus on identifying and managing the most common vineyard pests, especially powdery mildew. To register,call the Parks & Recreation Department at 707-944-8712 or visit its web site. In early 2008 I was watching the news on television. The economy had started its decline and the story concerned a woman in Pennsylvania who had been laid off from her job. She was filmed pushing a shopping cart out of a grocery store and was asked what she had purchased with her final paycheck. She proceeded to show the reporter all forms of processed foods in cans, boxes and plastic containers. The first thing that struck me was here was someone who had just lost their source of income, but they had also gained something they may not have had before and that is time. Now she could prepare more time-consuming but less expensive, more nutritious food for her family. Yet she had chosen to purchase food that required minimal preparation time, was costly and for the most part lower in nutrition. The second thing that struck me was that this woman now could have the time to devote to gardening for food to feed her family. I don’t know if she had a yard with room for a garden, had access to a community garden plot or had a friend or relative with room for a garden but if she did, then gardening for food was right for her. 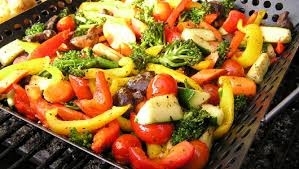 She could feed her family fresh veggies and also preserve some of the bounty of the garden for later consumption. Eating more nutritious food at a lower cost is a win/win situation. This is especially true as the bounty of summer gardens begins to fill our tables. I’ve been gardening for food for many years, not because I can’t afford to buy processed foods but because I want the freshest, most nutritious organic and non-genetically engineered food possible. I want to know where my food comes from, how it was grown and I want it year round. I started with several 4 ’x 8’ raised beds and every year I added one or two more until I now have 32 raised beds. No one needs 32 raised beds for a family of two, so much of what I grow is given away and I take great pleasure in being able to do this. Gardening for Food includes home-grown veggies such as tomatoes, summer squash and eggplant that you plant in the spring to eat in the summer plus winter-planted veggies such as garlic, onions and potatoes that can be stored and enjoyed months after harvest. The garlic we grow usually lasts for almost a year. Onions will last for months and we never have to buy potatoes between June and December. Another spring or early summer veggie I love are shell beans as they last forever, and when you grow your own and get used to eating beans that are less than a year old you realize how much more flavorful they are at a young age. A few years ago we started growing Floriani Red Flint Corn, which is widely planted in Italy for grinding and making polenta. You’ve never had polenta as rich and flavorful as that made with your own Floriani Red Flint Corn. Last but not least are the veggies that are planted in late summer to early fall. 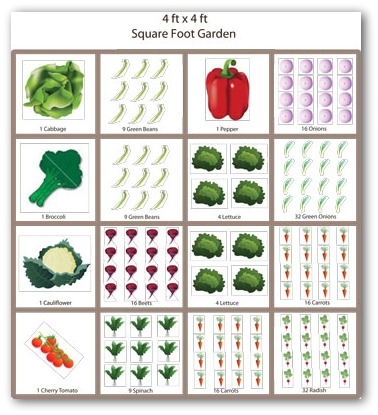 These include broccoli, cabbage, cauliflower, kale, kohlrabi, chard and lettuces. It’s very rewarding to watch them grow and be available to you. Gardening for food also includes preserving some of the harvest through canning, freezing or drying so that you can enjoy the production of your garden months later. In our house, there is no such thing as too many tomatoes. Some of what isn’t eaten fresh is skinned and seeded, becoming first tomato sauce and then catsup, chili sauce, BBQ sauce, marinara sauce or reduced until it becomes tomato paste. Other tomatoes are canned whole or chopped up and canned as salsa. Chile peppers are roasted and then frozen for use later in many southwestern dishes. We dry chiles, tomatoes and herbs for use as seasonings year round. It’s been over five years since I saw this story on the news, but I haven’t been able to get the woman out of my mind. My hope is that one person will read this article and start gardening for food and then tell another person until we have everyone eating less expensive and more nutritious food day in and day out. Vegetable Workshop: Napa County Master Gardeners will lead a workshop on “Cool Season Veggies” on Sunday, August 18, from 2 p.m. to 4 p.m. at the Yountville Community Center, 6516 Washington Street, Yountville. Learn how to grow your own vegetables even when days are short and nights are cold. The key is starting while weather and soil are still warm. Learn which vegetables will thrive in cooler temperatures, how to protect them from heat when they are getting started, and how to time plantings for months of harvest. Cost is $15 per person ($10 for Yountville residents). Class size is limited and pre-registration is required. Register through Town of Yountville, Parks and Recreation: Mail in or Walk in registration (cash or check only). For additional information, call (707) 944-8712 or visit their web site. Open Garden Days: Napa County Master Gardeners welcome the public to their demonstration garden at Connolly Ranch on the first Thursday of every month, from April through October, from 10:30 a.m. to noon. Master Gardeners will be on hand to answer questions. Connolly Ranch is at 3141 Browns Valley Road in Napa. Napa County Master Gardeners are required to spend 12 hours on continuing education each year. One of my favorite continuing-education classes is “Tool Time,” taught by fellow Napa County Master Gardener Matt Jones. The best part of the class is the show and tell, when we introduce others to our favorite tools. One Master Gardener bought a prune-and-hold pruner that does not have a rope. It is virtually one handed. He picked it up at the San Francisco Flower & Garden Show a few years back. It extends to four feet. A boon for the not-so-agile gardener, it eliminates the bending over to pick up pruned limbs. The head also rotates for more precise cuts. A smaller prune-and-hold pruner, purchased at the Heirloom Festival in Santa Rosa last year, is another gardener’s tool of choice. A true one-handed pruner, it holds on to the branch until you drop it in the garbage receptacle. One small handy tool is a pen-size blade sharpener. It fits in a pocket with a clip, just like a regular pen. It has three sides: flat, round and grooved. You can even sharpen your fish hooks. This tool was purchased at Lee Valley Tools online. One fellow Master Gardener uses her grandfather’s sharpening stone. It is still in great shape, and using it reminds her of her grandfather, who taught her the love of gardening. Another gardener’s sentimental tool is an uncle’s grafting kit. The knives are very sharp and the tools fit into a handmade case. One diminutive fellow gardener loves her watering can, perfectly sized for her small stature. She carries it with her as she works. A Homer’s All-Purpose Bucket from Home Depot, fitted with a canvas gardening catch-all from Mid-City Nursery, is lightweight and portable. Mine holds all the necessary equipment for almost every gardening task. My all-time personal favorite tool is an all-terrain garden cart. It resembles a four-wheel wheelbarrow with high side. Its tires have valve stems and a 90-degree turning radius. It climbs over rough ground and stepping pavers. It even has a dump function. I can push bags of compost out of my trunk into this cart and pull it wherever I need to dump the compost. Or I can use the cart to haul around an open bag when I’m spreading mulch. The cart is difficult to find. 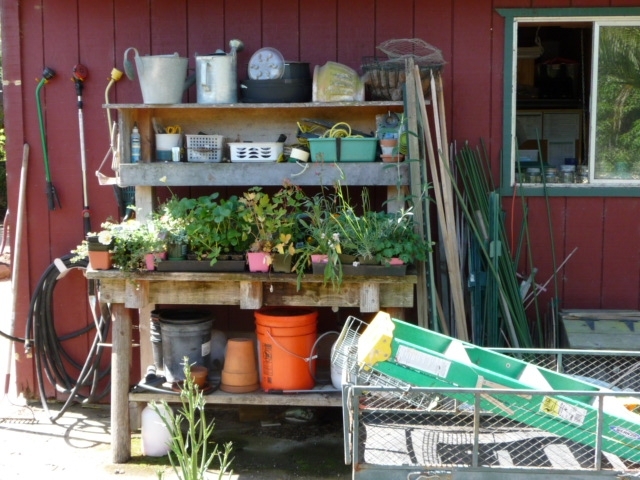 Most garden carts are made of steel mesh, and dirt drops through the holes. I found my cart at Home Depot and have seen them at other big-box stores. Shovel versus spading fork? The tines of a spading fork sink into the soil instead of slicing through, without much effort. The tines are more soil friendly, ventilating the soil instead of compacting it. To dig deeper or to add amendments, I can stand on the harp and wiggle back and forth without the load of a shovel. I can’t say enough about the new ergonomic tools. The shovels, hoes and spades with circular handles are easy to grip. Some come with an assist bar on the handle to redistribute the load. Many small tools, from pruners to PVC cutters, are being designed with a ratcheting motion instead of requiring brute grip force to power the cuts. Even drip irrigation is accommodating aging gardeners. The “blue line” half-inch irrigation tubing does not require compression fittings. The easy fittings go over the tubing for about a half inch and then screw on. This is not only easier on the hands, but you can also reposition the fittings. Raised beds are not a tool, but they are one answer to keeping gophers, moles and voles out of the garden. They are also easier on the gardener’s back. Line the bed bottom and a few inches of the sides with hardware cloth, stapling it to the sides of the bed. The lining will foil even small critters. Some garden writers suggest chicken wire but this material breaks down. What’s more, small pests can get through the holes, and a strong gopher can bite through the mesh. I enjoy seeing the mounds around my raised beds where gophers have tried to get in. Consult the Napa County Master Gardeners’ web site (address below) for more information on constructing raised beds. Keep your tools clean, sharp and oiled if you want them at their best. I’ll be gathering up my tools to attend Matt’s “Tool Time” workshop next weekend. Hope to see you there. Mail in registration (cash or check only). Join Napa County Master Gardeners for a workshop on “Warm Season Veggies” on Sunday, March 24, from 2 p.m. to 4 p.m., at Yountville Community Center, 6516 Washington Street, Yountville. Plan and prepare now for your most successful vegetable garden ever. Learn what to plant from seed, how to choose transplants, and when to plant for a bountiful harvest from spring into fall. Register through Town of Yountville Parks and Recreation: Mail in or Walk in registration (cash or check only). For fees and additional workshop information, call (707) 944-8712 or visit the Town of Yountville web site.